Source: "Elliot Roosevelt and FDR Jr. (Date unknown) - Courtesy of the Franklin D. Roosevelt Presidential Library and Museum, Hyde Park, New York. - Reproduction number: 789(120)"
DOWNS: Ever since the war began we've been hearing about fighter pilots and bombing heroes. Today we have a representative of what might be called the "mystery service" of the United States armed forces. And to tell us about it is a man from Texas about whom you all know. He is Colonel Elliott Roosevelt of Fort Worth. His father lives in the White House. Colonel Roosevelt, you are commanding officer of a Reconnaissance Wing stationed here in Britain. Now, just why should Reconnaissance be called the "mystery service" of the air force? ROOSEVELT: I don't know. Outside of certain secret equipment that we use, there's no particular mystery about our work. We send boys out in unarmed, fast planes who fly through every kind of opposition the enemy has. Their job is to get photographs and weather information and get back with them at any cost. DOWNS: That's pretty dangerous, isn't it? 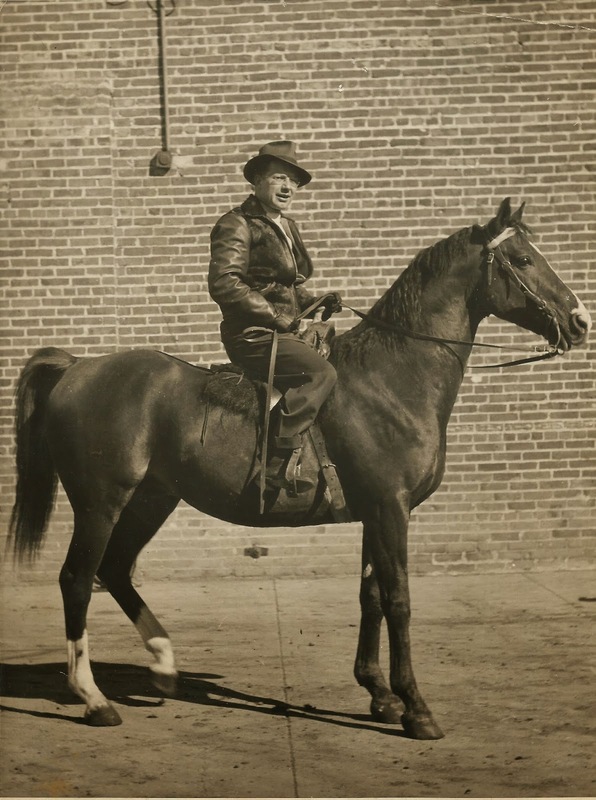 ROOSEVELT: Our missions are never joy rides. You see, when the Photo-Reconnaissance boys go out, they maybe have a score of targets to hit with their camera lens, not just one Me-109 or an aircraft plant. And their missions are never completed when they shoot the target with their cameras...they still have to get the photographs back. The weather boys have to range all parts of enemy territory every day. DOWNS: What happens to this information? ROOSEVELT: These pictures of enemy territory go to the highest Staffs of the Allied Command for study. This includes the air-force, the navy and the ground forces. They are invaluable in precision bombing...and for the navy and ground forces in the coming invasion. DOWNS: Some of your Reconnaissance boys were in action in Africa, Sicily and Italy. What has become of them? ROOSEVELT: A lot of them are now operating up here. Take Johnny Hoover from Cresson, Pa., for example. He's only 22 years old but is one of our veterans. He has 2 DFCs and 13 air medals. I believe he has completed more missions than any American reconnaissance pilot on this side of the Atlantic. Then there's Walter Wightner from Yonkers, N.Y. He is 25 [possibly 24] years old. He was the first American reconnaissance pilot over Berlin. He recorded the Silver Star the other day. Kids like these are top-notch pilots doing one of the most important jobs of the war. They will stand up with the best fighter and bomber pilots in any air force in the war. You have to be more than a specialized photographed to succeed in Photo-Reconnaissance. You have to be as good as the best fighter pilot in the world...and you have to be as steady and accurate as the best bomber pilot and navigator in the world. And you have to do the whole job with no more protection than a jack rabbit. DOWNS: Then Photo-Reconnaissance is sort of the scouting service for a modern army. ROOSEVELT: That's exactly it. My boys are the Buffalo Bills and Kit Carsons of this war. And we intend to scout Hitler clean out of business. DOWNS: Thank you Colonel Roosevelt. That was Col. Elliott Roosevelt reporting on the work of the Photo-Reconnaissance branch of the air force. I return you now to CBS in New York. One of the biggest television news-personnel shakeups in many a day has hit CBS: Doug Edwards, after fourteen years on TV's oldest continuous newscast, the 7:15 report, is being replaced by Walter Cronkite. State Department correspondent Bill Downs, after more than nineteen years with CBS News, is walking out. Cronkite will hand over his "Eyewitness" narrator's role to Charles Collingwood; he will also be pulled off the "Sunday Night News Special," but the network is not prepared to say who will get this assignment. Edwards will replace Collingwood on the 3:55 p.m. five-minute daily news. Downs is the third well-known, longtime CBS newsman to check out of the network in recent months. The other two, Ron Cochran, once a fixture on WCBS-TV's 11 p.m. news, and former CBS chief Washington correspondent Howard K. Smith, have both gone over to ABC's news staff. Disclosure of the Edwards-Cronkite switch yesterday morning caught CBS officials unprepared. Later in the day the network officially confirmed the shuffle in assignments. The reason for it, said CBS News president Richard M. [sic] Salant: "These reassignments will give added strength and depth to CBS News coverage." A CBS spokesman denied the shift on the evening newscast was impelled by NBC's Huntley-Brinkley competition. "After all," he said, "Edwards' ratings have been running pretty even-steven with them." Cronkite, who will take over the newscasts April 16, will become "managing editor" of the show as well as its anchorman. Don Hewitt will continue as producer. Cronkite will continue as narrator of "Twentieth Century," the Sunday evening documentary series. He was in Seattle yesterday covering the forthcoming Century 21 Exposition for this program. Tom Stix, Cronkite's agent, quoted the newsman as "delighted" with his new evening news assignment. Edwards flew yesterday to Oklahoma City to be principal speaker last night at an annual "brotherhood citation dinner" of the Oklahoma Conference of Christians and Jews. Two years ago he received an award from the group. Before leaving, the newsman said he "in no way disputed" CBS' right to make the decision. He admitted trying to get a release from his contract, but declined to confirm a report that he had asked to be assigned the "Sunday Night News Special" and was turned down. He will continue his local news stint on Channel 2 at 11 p.m. The network said he might do some "CBS Reports" and would be given other "important network assignments." Last year CBS required Edwards to quit his host's role on "Circle Theater" as incompatible with network news policy. Ron Cochran quit CBS News and took on the role. Downs said his departure from CBS was "amicable" but hinted he had not been happy with recent developments. "I'm not willing to be put out to pasture yet," he commented without elaborating. Asked about his plans, he replied, "I [am] going to take it easy for a while. I'm writing a book." It's a novel, he explained. As you know, the frustrations of reporting for this network are as great in a different kind of way than they grew to be in CBS. I quit Columbia after 19 years and 7 months in disgust at the midget-minded, rabbit-heartedness of the Salant-Clark regime (which never did decide the difference between analysis and commentary and have yet to recognize good reporting). Although the AFTRA strike does not appear to guarantee that any contract renewal with ABC will be much more favorable than my old arrangement, I'm not convinced that the ABC top executives nor the news management being developed on West 66th street (even if the ITT merger goes through) will ever become adult, professional, responsible or respectable. I suppose it's true in all broadcasting shops to some extent or other, but sometimes one gets the feeling that news selection and coverage is directed and assigned by a class of backward kindergarteners, constantly in a tantrum of fear that Elmer Lower will eat them alive if they make a decision. One feels that if they had a million dollars to spend on a story, the first thing they would do would be to change it all into dimes. On the credit side, I must emphasize that not once has there been any attempt to inhibit my writing either for radio or TV—and no one in ABC has even mentioned the so-called "editorialization" issue which was the ever-bleeding anathema of Mssrs. Paley and Stanton. In reading your book—and thanks for the mention in the introduction—it brought back a lot of memories of old battles won and lost—but seldom compromised. And the echoes of Ed and the unforgettable Murrow fury at injustice and/or stupidity made us sad. If I had any criticism of the book, it was that you were unable to expand the indictment to include NBC, CBS and the lesser change guilty of the same kind of abdication of industry responsibility for the sake of the holy, gawdalmighty, much-bedamned 50¢-dollar. But to document the sins of the competition would mean the opus would probably never be finished. Some twenty years ago, a newspaper reporter would not knowingly admit that there was any such thing as a radio newsman. And even those of us who left newspapers and press associations to take up this exciting new medium were scorned by our colleagues as ranking somewhere between peddlers of snake oil and fallen chorus boys. 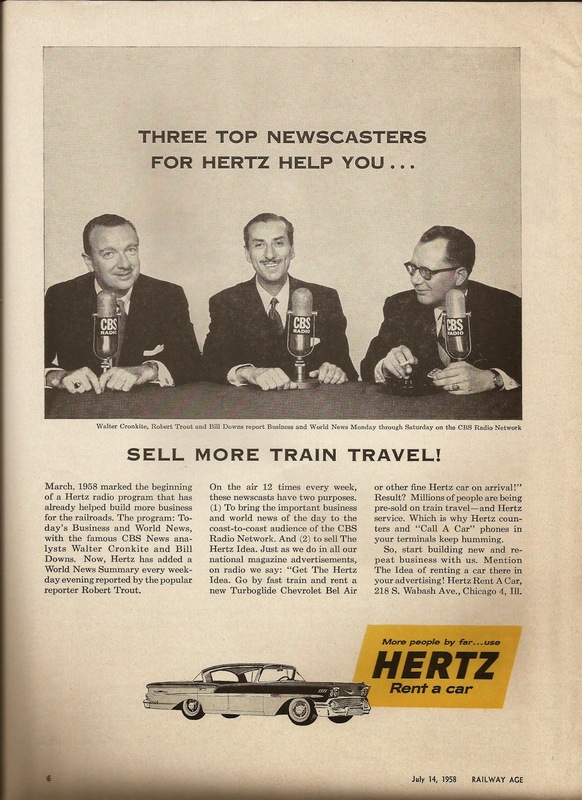 Ed Murrow, Hans Kaltenborn, Ray Swing, Bill Shirer and others brought responsibility and respectability to radio journalism—along with the realization among the Gutenberg boys that the radio reporter could broadcast to more people in a two-minute morning world roundup of the news than most of them would write for the rest of their lives. The television news reporter has had a similar but shorter journalistic purgatory to endure. Much of it was his own fault as he learned to use and adapt the sound camera to the news conference or the fast-breaking story. Much of the deserved criticism of early TV reporting was the fault of employers. Some thought handing an announcer a microphone to stick in front of a victim's face and asking an inane or meaningless question automatically made that reader-of-commercials a reporter. Edited by the director of CBS News, John Day, the book "Television News Reporting" (McGraw-Hill) explains the collective experience of what every TV news show actually is—a collective effort by an increasingly expert group of people pioneering together among the cathode rays and decibels of a marvelous and sometimes frightening medium of immediate communication. The mere organization of the scores of people whose efforts go into a single 15-minute report of, say, Dogulas Edwards and the News might involve an Egyptian delivery boy rushing to get some Nasser film on an airliner to New York...a cameraman like Cyril Bliss arguing with Polish police to prevent his film from being confiscated. CBS News Correspondent David Schoenbrun in Algeria or Peter Kalischer of Quemoy risking gunfire to get an eyewitness report. After which the material must get to the editors, cutters, writers, artists and fitted into the day's format to be matter-of-factly introduced by Edwards...or Murrow, Collingwood, Cronkite, Sevareid, Trout or Smith. How all of this is done is explained in "Television News Reporting." However, the book does leave something out. And that evolution—the conversion, if you will—of the TV news reporter. As of now he is just out of the larva stage. 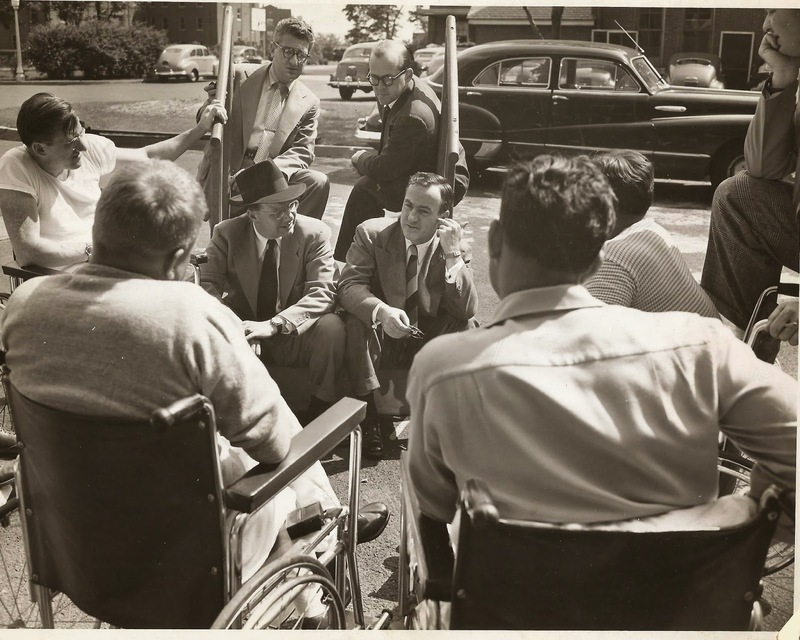 Any close observer of the species would have discovered that even the hard-bitten members of the press began accepting television as a bona fide news reporting medium at the 1948 national political conventions in Philadelphia. One had only to count the number of political pundits from across the country who spent so much time covering the Dewey and Truman nominations in front of the TV tubes established in the air-conditioned Convention Hall press lounge of the Pennsylvania Railroad. From then on, there was no stopping television news. But for the radio reporter, the transition produced growing pains that sometimes were very acute...other times they hurt only when you laughed. 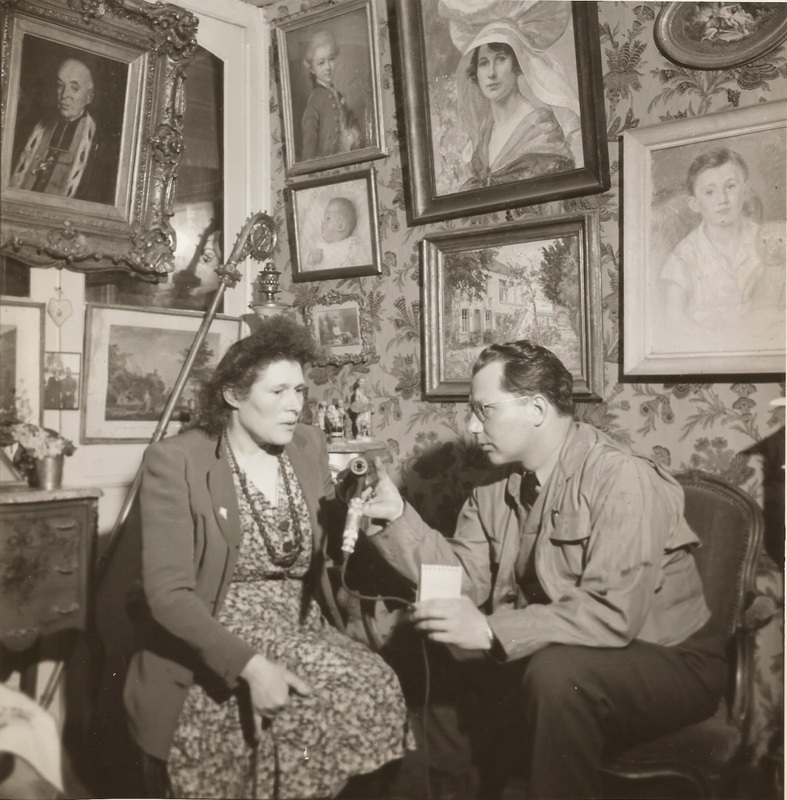 CBS News sent this correspondent to Berlin after the 1948 elections. The Russian blockade had just begun, and the air lift which was to save the isolated city was just getting under way. Our predecessor, Allan Jackson, left the CBS News Berlin bureau a Stancil-Hoffman tape recorder—the main tool of the radio broadcaster at that time. Shortly afterward there arrived by air mail a 16 mm Bell and Howell magazine camera, a supply of film—and a book. The book was a Kodak company volume with a title something like "how to make amateur movies the easy way." It was very good. It was also at this time that electronic schizophrenia set in. And it was the beginning of what was then called the "pack-horse school of reporting." CBS News foreign correspondents became badly split personalities. To carry and operate a portable tape recorder and a 16 mm camera simultaneously was obviously impossible. Then began the job of trying to second guess a story. A riot by East Berlin Communists was easy. You took the camera. A statement by the Berlin commander, General Lucius Clay, was obviously a job for the tape recorder. The only trouble was that CBS Radio News wanted to know where were the sound tapes of the rioting. And CBS TV News always demanded why were there not silent shots of General Clay to be played behind Douglas Edwards as he read the statement. The Stancil-Hoffman recorder weighs only some twelve pounds, but there also had to be another bag to carry spare reels of tape and two kinds of batteries. The 16 mm camera also was not overly heavy. But add it to a half dozen additional film packs, the shoulders begin to sag. Also the new-style electronic reporter had to take his portable typewriter on out-of-town stories, along with log forms, carbon paper, shipping labels, and the usual notebooks, typing paper, and other incumbrances. Consequently, ten years ago the fully equipped CBS News radio and TV foreign correspondent had a camera and an accessories bag slung over one shoulder, a tape recorder and an equipment kit over the other, his typewriter in one hand and a briefcase containing a portable office (with flash) in the other. Cover a story? Hell, it was enough to just move. At first, all of this was very exciting. Learning about lens changes, film speeds, establishing shots, exposures, panning and the need to eschew cocktail parties if you want to make hand-held long-range shots with a 4-inch lens. But then came the professional—and psychic—shock. As radio reporting and reporters matured, there had developed a personal pride in putting the story into perspective, studying and analyzing its meaning, or just broadcasting the excitement of a noteworthy event. But as a tyro television journalist with his brand new camera, the same reporter suddenly came to realize that this job mostly is done automatically through the camera lens—AND WITHOUT A WORD BEING SAID. Q. - So what are you? A. - A goddamn man-servant to a box, a piece of glass, and a strip of acetate. Q. - Okay then, who is the reporter here? A. - The box, dammit. I only push the button. Q. - So, okay, what are you, bigshot? A. - A pimp to a picture machine. Much of the feeling passes after a while and you learn the excitement of visualizing and building a filmed news story. Trying to learn something about TV news overseas in 1949 was handicapped by the fact that the industry was barely getting underway in Europe. Also the reporter-cameraman operated blind—he seldom if ever got to see his own stuff. The whole experience was a little like trying to catch a flying bat with a butterfly net in a blacked out Madison Square Garden. Still spot television film was so rare in those days that a surprisingly large amount of the Berlin bureau's blockade film got used. It was the same when this reporter transferred from Berlin back to Washington in 1950 and made the mistake of volunteering to "help out" with the Korean War coverage. Six days later we were on our way to the Far East. In the early days of the sticky retreat down the Korean peninsula there were no broadcast lines or facilities available. For the broadcaster, it meant repeated flying from Tokyo to Pusan or Taegu and then hitch-hiking to the front—if the front didn't beat you to it. Again CBS TV News programs were starving for spot film. Almost anything would be used even if it were badly exposed and out of focus. And in the early days of the war, a lot of that kind of film got on the network. However our skill was developing somewhat and it is with considerable pride that we occasionally humble our photographer friends by pointing to a Newsweek story of the times. Newsweek describes Downs as "a natural born cameraman." We were going to have a shoulder flash made up to wear on our uniform sleeve with that label. However the bona fide photographers in the Tokyo press club threatened to tear the sleeve off and return it to us with the arm inside. By this time, CBS Television News had expanded and grown. Newsfilm Syndication was formed. Ed Murrow and Fred Friendly had already set the pattern for the industry's news documentary by their superb weekly "See It Now" series. 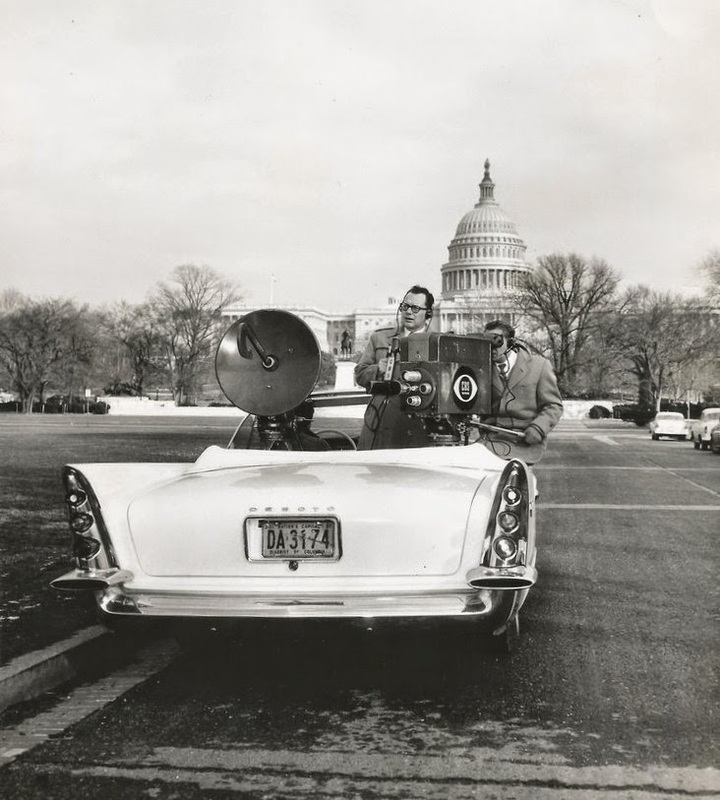 The 1952 presidential campaigns found the CBS News radio reporters and the television film crews working almost independently of each other. So many thousands of words were thrown at so many millions of people from the Eisenhower and Stevenson caravans that the brain became numb and there seemed to be a political callus on the side of the public retina. Here the problem was shipping film to the nearest CBS TV affiliate for rapid developing and cutting to get it on the network the same day. For radio, it was finding a pause in the constantly moving caravans where a piece of tape could be dropped for feeding to New York...or where a live microphone was available for a direct feed for the various news programs. But it was in setting up a television operation in Rome in 1953 that this correspondent really learned about the facts of post war international communication. We were fortunate to locate an excellent cameraman in Joe Falletta, a former GI from New York City whose Italian parents had given him a language background which enabled him to marry one of Italy's most beautiful operetta stars. 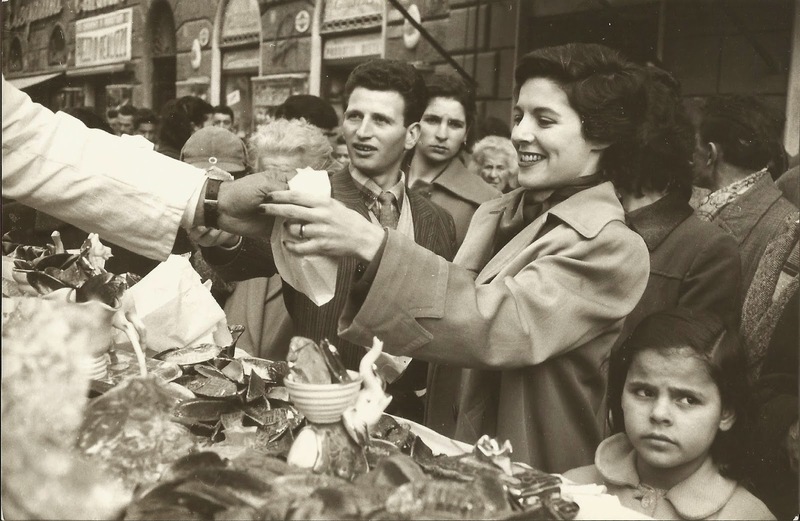 However, since CBS News standard film development procedures and other factors demanded that American 16 mm film be shipped into the Rome bureau, our troubles with the Italian bureaucracy began. Italian law is designed to protect that nation's resurgent film industry. It is one of the government's greatest dollar earners. So to control every phase of this business, you need both import and export licenses to ship American manufactured film. Also the footage is strictly controlled. So involved are the bureaucratic details of this operation that a pair of enterprising Italian exporters set up and agency just to deal with these matters for the U.S., British, French and other foreign television and movie companies shipping film in and out of the country. At last report they were making a good thing of it, too. That was only part of the job. 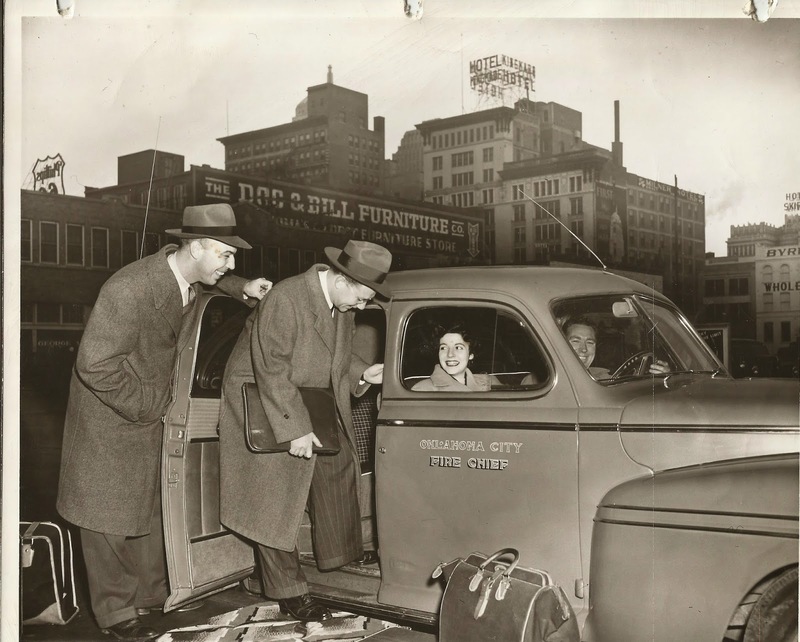 Your 1950 new-style electronic foreign correspondent must not only be able to circumvent bureaucratic red tape, he also must be an expert shipping agent. This means knowing what planes are going from Rome to New York and at which of the 24 hours of the day they will land and take off. He must be able to navigate his Fiat with the most reckless of Italian drivers in the race to Ciampino airport to get film aboard Pan Am, TWA or any other airliner which goes directly to New York. But he must also make sure that planes are not changed in Paris, London or Brussels because film inevitably gets lost in the jumble of a foreign airport. When the New York office finally sent over the latest Bell and Howell sound camera—brand new—Falletta stood with us gazing in silent admiration when we first hoisted it on its shiny tripod. The camera's three lenses stared back and sneered. What we discovered was that the big Bell and Howell with its 1,200-foot film magazines weights more than a half a ton with all its various independent power packs, lights, zizz wheels, microphones and purtoins. We also had forgotten that Falletta did not have a sound man. So back to the instruction manual and the mimeographed instruction from the CBS technical experts. We became a sound man—maybe not the best—but there was always noise of one kind or another on the film. The arrival of the sound camera also meant that some of our editorial frustration could be worked off. Then it was possible to write oneself a piece of "what it means" copy, grab a microphone, set the sound level, rush around to the front of the camera and tell Falletta to let it roll. We talked a lot like that, looking into the wide-angled lens with the Piazza Venezia or St. Peters in the background, giving profound analyses of the latest Italian political, social or economic crisis. We suspect that not much of this stuff was used. But, as we said, it was good for the journalistic soul. Television news directors and assignment editors dream of the perfect foreign correspondent—the reporter-cameraman. They might as well stop, or start experimental breeding. Under present conditions he would have to be at least twelve feet tall, three ax handles across the shoulders, possess at least three pairs of arms and have a highly controlled prehensile tail for twisting knobs. This paragon also would find it useful if he could be specifically bred to develop a pair of marsupial pouches—a la kangaroo—but preferably located on each hip. He also would need a pair of eyes mounted on antennas with a full 360 degree swivel so he could raise them to look over the camera magazine to see what the opposition is doing—or to watch for the Rome or Athens—or Istanbul or Cairo—police if he did not have a municipal permit to set up his tripod in the streets. In fact, give this ideal cameraman-reporter an extra head. For few cameramen filming a statement read, say, by the Pope or a Premier or an Ambassador can tell you in any detail afterward what the man said. Today, it is generally becoming accepted that the reporter, the cameraman and the sound man all have different but equally important jobs to do. Most CBS News bureaus domestic and overseas have so divided the labor. It's expensive but in the long run it pays off. However, the electronic reporter must know the tools of his trade. It's vitally important to have a working knowledge of the camera and what it can do; the limitations of light and sound and the requirements of the cutters and editors who eventually must put together the story. We got the experience the hard way. Eventually we suppose some genius will invent a gadget which will pick up the brain waves of the leg man on the spot and transmit the picture from the reporter's eye directly to the screen—with perhaps a censor's switch at hand. This future electronic reporter will have it easier and live longer. But he won't have as much fun. An unconfirmed report that Germany has asked for an armistice turned Brussels into a madhouse for a short time today. The bells in all churches were ringing. People paraded the streets; shaking hands, weeping and kissing everyone in an Allied uniform. This report, which as far as I can judge has come from Algiers radio, seems to be a false alarm. But the Belgian people didn't care, and the capital went wild. The excitement has died down now since no confirmation has come. The cheering, singing crowds have kept going day and night since the British troops freed the city two days ago. You wonder where they get the energy to keep on celebrating. They have worn me out completely. After four years of occupation, it seems to take a long time for the people to get used to the idea of freedom again. And a report of an armistice is almost too much for them. They are not waiting for confirmation, they are just celebrating flat out. 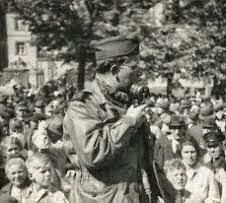 I met three American airmen who had parachuted from their flying fortress and been sheltered by the Belgian people. Rexist party spies heard of them and convinced the people hiding the Americans that they would get the fliers to safety in Switzerland. But instead of taking them towards Switzerland, the traitors turned the American airmen over to the German army authorities. 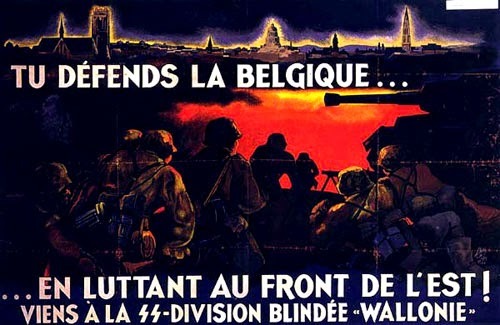 The Belgian Nazis were dealing in American fliers forced to come down in the country. They received something like 10,000 francs for every escaped airman turned in. That is one reason that the Belgian people demand the lives of the traitors. There are many more. Brussels had a population of something like 40,000 Jews. Early in the occupation of the country, about half of these Jewish people were taken out and shot, the other half was sent to Germany. The Rexists also helped do this dirty work. They were nice people. 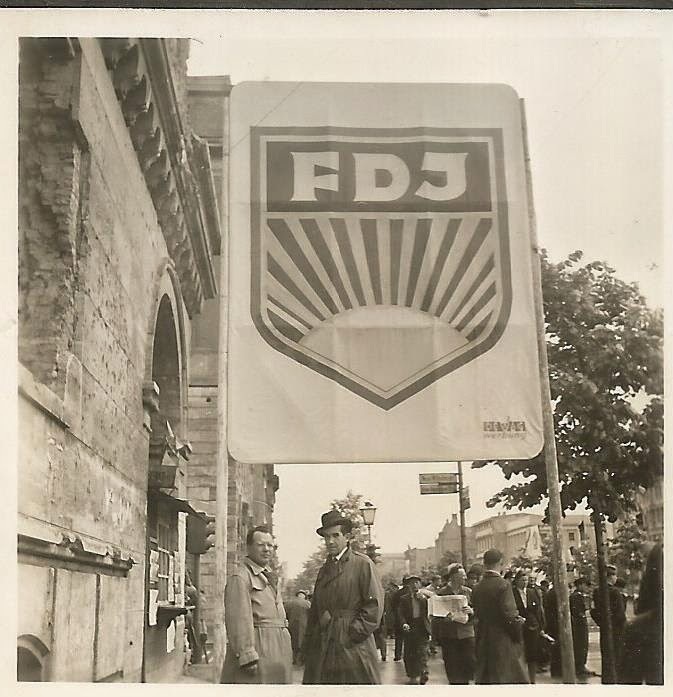 The Rexists organized a Belgian SS legion which now is fighting for its life in Estonia. The Belgian people hope that the Russian army will let none of these escape. They feel the Red Army can do the job just as well in Estonia as patriots can do here. The first editions of the Belgian underground newspapers were published in the open today. They are single sheet papers printed on two sides. All acclaim the liberation and all demand death to the traitors. The newspaper, Free Belgium, is having a field day of satire. It explains that the Rexist newspaper Pays Reel cannot publish today for "technical reasons" and then it says that, in a spirit of the satirical brotherhood, it will publish the article that Pays Reel would have if it had not been captured by the Allies. It follows with a perfect example of Nazi propaganda. The paper says that the German high command is using (?) elastic defense to refuse the Allies the battle they seek. It describes the Allied troops as brutes and gangsters and gives a description of the American army that reads like this: "The Americans are nothing but animals with baby faces deformed by the use of chewing gum." That is the kind of stuff that the Rexists would have been trying to sell the Belgian people for the past four years. And another reason the Belgian people want revenge is the methods the Rexists used to protect themselves. 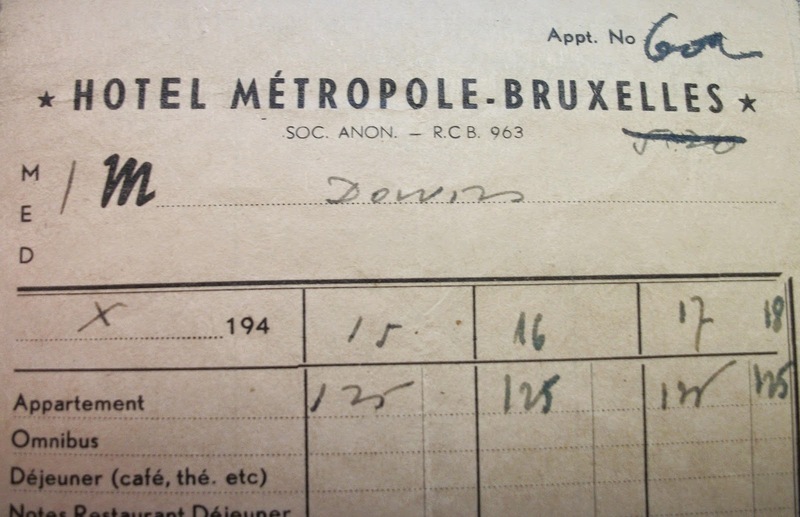 Every Rexist carried with him a list of five names of suspected Belgian patriots who were to be shot as hostages in case the Rexist was shot. The White Army learned of these lists and kept on shooting Rexists, but they switched the lists of hostages, putting in the names of five collaborators to die instead. It worked in several instances where collaborators were shooting each other. It is too early yet to predict the form of the new Belgian government. However everyone to whom I have talked are in unanimous support of the Free Belgian government now in London under the Prime Minister W. Pierlot. The Belgian people, as far as I can judge, want to keep their king. Leopold has been a prisoner of the Germans since the fall of the country. Reports now are that he was taken as a prisoner to Germany shortly after the invasion of Normandy by the Allies. No one now seems to know exactly where he is. The left wing newspaper, The Red Flag, in its first above-ground edition today gave a clue as to how the patriot political leaders are thinking. Red Flag said that this is not time for petty criticism of the Pierlot government, but urged that the government be allowed to settle down before the work of cleaning begins. Belgium has its freedom. She does not intend to lose it again. 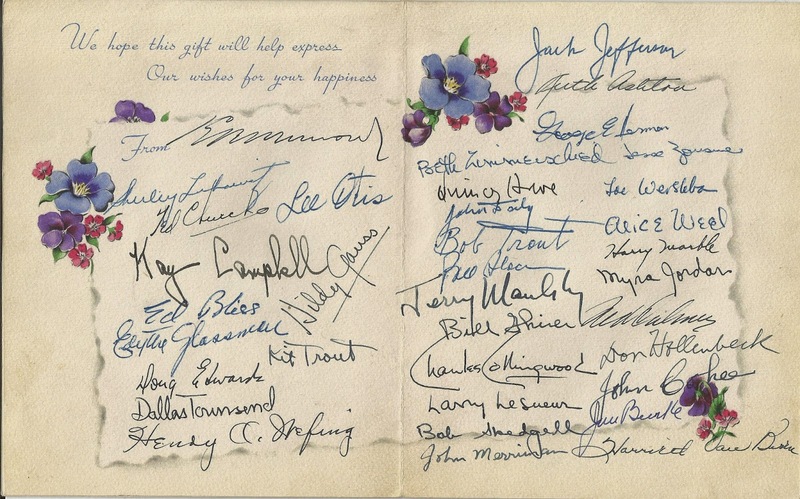 A card from 1946 from the CBS staff congratulating the Downses on their wedding. Signed by: Edward R. Murrow, Shirley Lubowitz (before she married Joe Wershba), Lee Otis, Ted Church, Kay Campbell, Ed Bliss, Doug Edwards, Dallas Townsend, Jack Jefferson, Joe Wershba, Charles Collingwood, Don Hollenbeck, Larry LeSueur, John Merriman, William L. Shirer, Robert Trout, John Daly, Quincy Howe, and more. Here in Washington there's a game called "President-watching." It's the favorite indoor sport of most of the diplomatic corps and absolutely all of the politicians who jam this capital. "President-watching" also is the main assignment and bounden duty of the White House correspondents...who by the very nature of their jobs, vicariously live the official life of the man who occupies the Executive Mansion. We have just returned from a long weekend in Texas covering Mr. Johnson. White House correspondents keep his appointments and engagements under constant scrutiny; they analyze his temper foibles and fevers; they criticize and sometimes praise his speeches. They make private jokes about him and the life he leads them. And pro or con, the men and women who cover the White House are always sympathetic about the terrible burdens of the presidency—no matter how much they approve or disapprove of the man himself. Out of this close observation of the Chief Executive comes the stuff of biography and of legend—which eventually distills itself into the thing called history. Today Lyndon Johnson completes his 16th month in the White House. It is clear, even to this part-time "President-watcher," that the past year and four months in the White House already is leaving its mark on Mr. Johnson. There has been a change...the Texas politician who left the Congress with the respect and admiration of his fellow Senators because of his skill as a master persuader and maneuverer of votes...is no longer the same man. It has been a subtle and basic kind of change...part of it has been the result of holding the awful power of the office...and part of it appears to have been a personal and deliberate effort to improve the Johnson image, as they say on Madison Avenue. The corrupting influence of Executive power has been proved in history too often to argue about it. The other side of this coin in the American democracy has been the responsibility that goes with the office of the Presidency. And it is the responsibility which seems to contain the magic of the White House which changes the men who live there. This magic worked on Harry Truman and Dwight Eisenhower. And before his assassination, the Presidency already had left its sobering mark on John F. Kennedy. The youthful brashness was being replaced by a maturing patina of real statesmanship. The past 16 months have produced a notable contrast in the public personality of Lyndon Johnson. There has not been—nor will their be—any apology for his political history...but at the same time, there seems to be a discarding of much of the southwestern "dressage"...the regionalistic emphasis on the acts and words which produced the "wheeler-dealer" charges his critics likes to repeat. Although Mr. Johnson could not erase the twang of the Texas hill-country from his speech if he wanted to—and he doesn't—the Presidential vocabulary has taken on a new dignity which goes beyond the demands of his office and becomes deeply and sincerely personal. It must be assumed that when a man becomes President, he eventually asks himself "what kind of President do I want to be?" For the answer, he must look back at his own beginnings and his root-country for the truth. Anyone who looks at the personal history of Lyndon Johnson will find throughout the many biographies the constant references and pride he took in becoming a country school-teacher. In fact, it was his knowledge gained in teaching Spanish-American youngsters in South Texas that put him on the road to a political career. He always carried the minority vote in his district. And following up, an estimated 80 to 90 percent of the so-called minorities voted for him in 1964 to put him in the White House by a landslide. It would appear that the 36th President of the United States now has decided his personal goal in history. In this era of exploding knowledge, Lyndon Johnson would like to be the kind of President who teaches his people while he leads them. Perhaps he sees himself as a kind of philosopher-President, a Texas Plato guiding Americans to build the perfect Republic. But more likely, he prefers the role of the teacher...keeping his pupils in line with stern discipline when they are fractious—as in Alabama—but who sees himself as a failure if he does not make his student-body aware of the immeasurable benefits due to them when they are graduated into his Great Society. From now until the President gives up the office, we-the-people can expect a lot of free instruction and high level lectures from the head master and superintendent of the biggest democratic institution on earth. And school-teacher Lyndon Johnson already has warned us that we have a lot of homework to do if we are to matriculate from this society into the Greater one...which he insists is America's destiny. 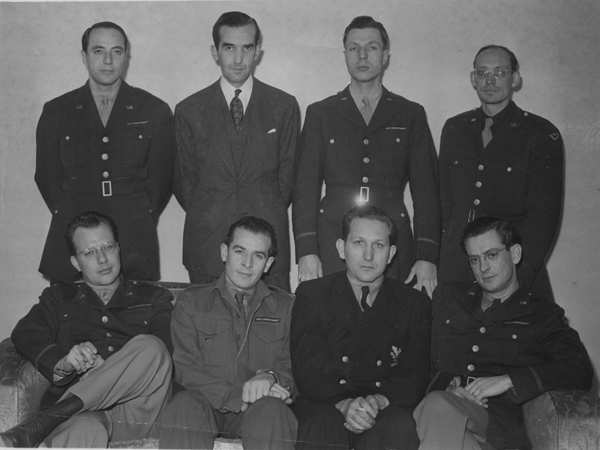 Caption source: Edward R. Murrow pictured with CBS' London-based D-Day team. 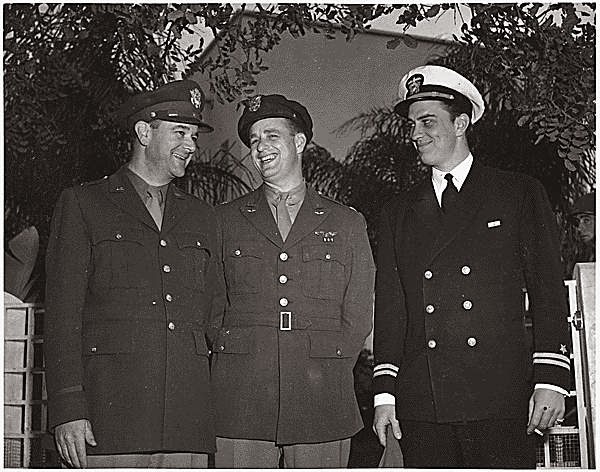 Front row (left to right): Bill Downs, Charles Collingwood, Gene Ryder, Charles Shaw. Back row (from left): Larry LeSueur, Edward R. Murrow, Richard C. Hottelet, Bill Shadel. The British Pathé recently made available for free nearly 82,000 videos from its vast collection of historical footage. This video contains unused footage of some of the Murrow Boys during a photo op in London. While the footage is dated 1943, this portion of the video is actually from June 1, 1944. The men in the video are the same as Murrow's D-Day team pictured above. 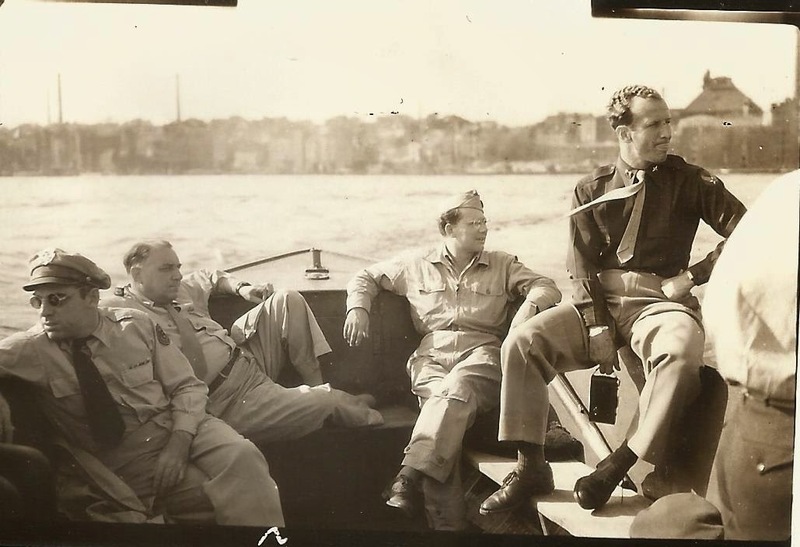 By some definitions, not all of the men featured are considered "Murrow Boys," but those featured did work with Edward R. Murrow during World War II. They can be seen at 3:12 in the video below. The men are: (standing, from left to right) Charles Shaw, Gene Ryder, Richard C. Hottelet, Larry LeSueur, Charles Collingwood, Bill Downs, and Bill Shadel. Edward R. Murrow is sitting in front. 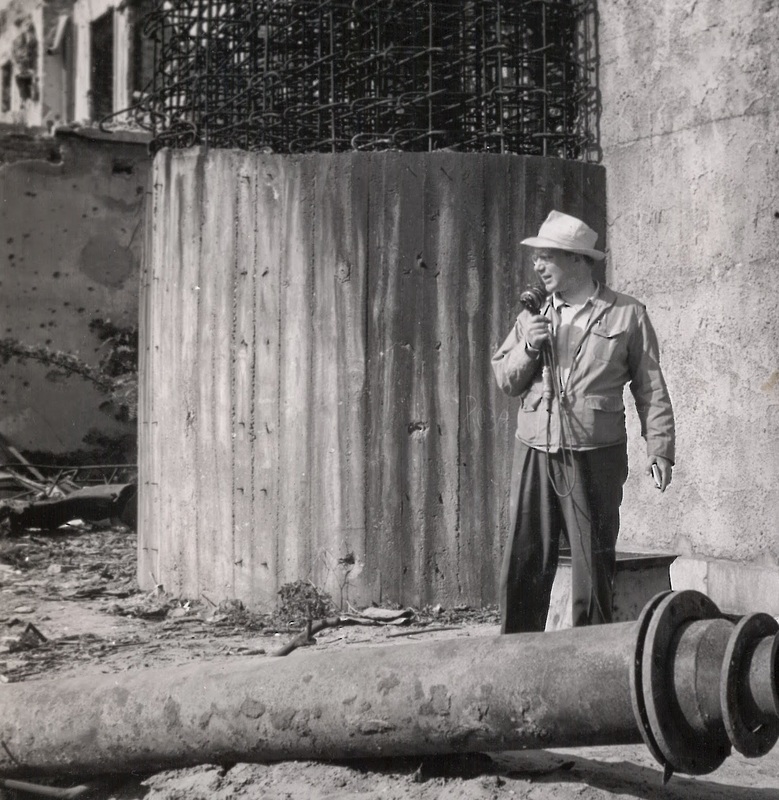 In 1945, Tex McCrary let a group of war correspondents across Europe and Asia as they covered the world in the aftermath of World War II. 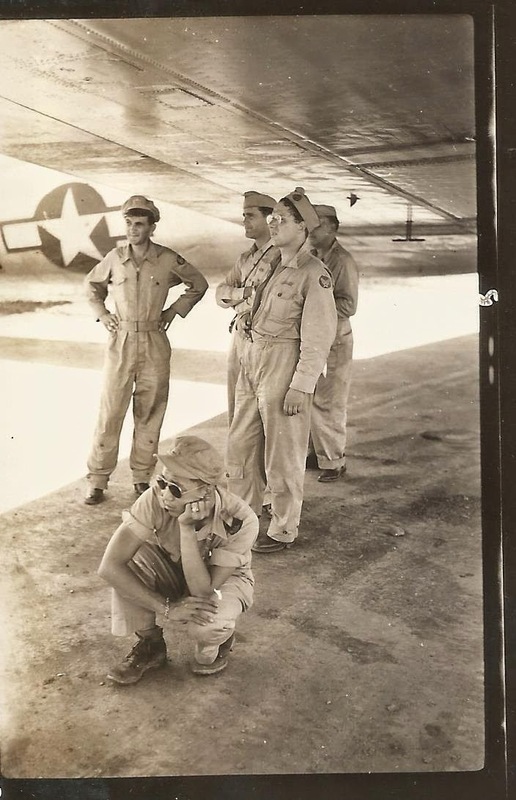 In 1947, Clark Lee wrote about their time in Saigon, particularly the lead-up to the death of Lt. Col. A. Peter Dewey and the skirmish that broke out afterward in September 1945. James McGlincy published his own account almost soon after, and Downs recounted it twenty years later in 1965. Both articles are featured below. 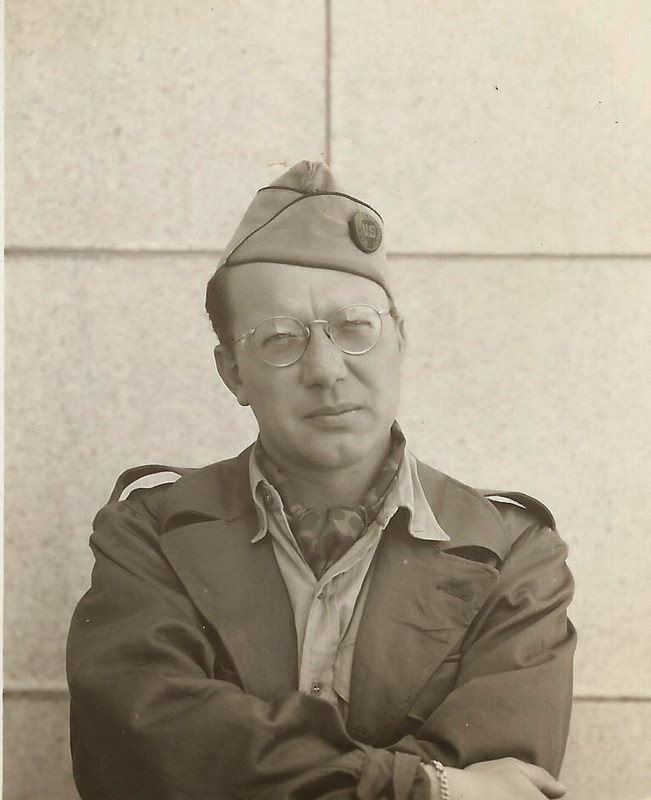 James McGlincy, United Press staff correspondent, covered the war in Europe and was the first Allied correspondent to send a dispatch out of liberated Paris. Assigned to the Pacific after the surrender of Germany, he was among the first newsmen to enter Tokyo and atomic-bombed Hiroshima and Nagasaki. But it was in Indochina nearly six weeks after the end of the Pacific war that he had what he called his narrowest escape. He tells about it in the following dispatch. William Randall "Bill" Downs is the son of Mr. and Mrs. W.R. Downs, [address], this city. Before the entry of the United States into the war, he was with United Press in London. Following the entry of the United States he spend a year in Russia as a correspondent for CBS. 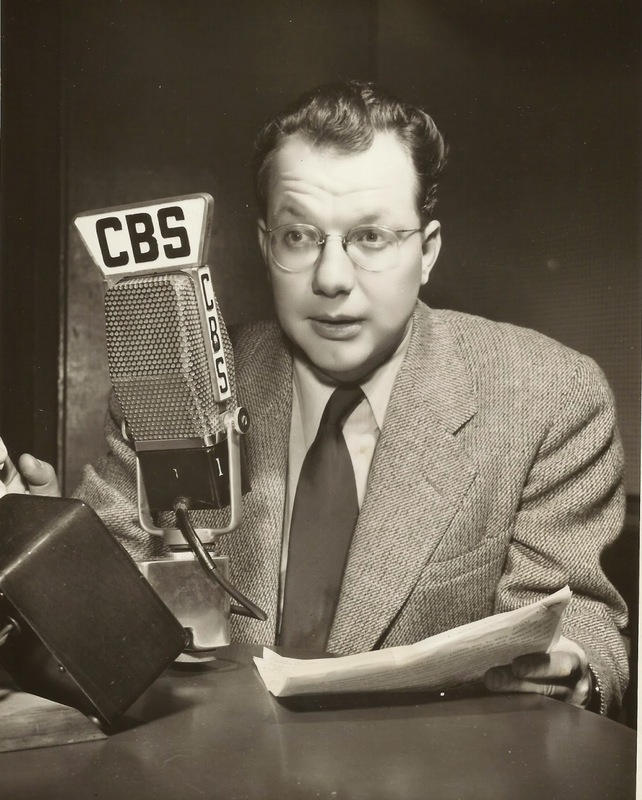 From Russia, Downs returned to the United States, returning to England in time to land with Allied troops on the Normandy beaches on June 6, 1944, where he made the first radio broadcast, representing CBS. He covered the war until the German surrender was completed. 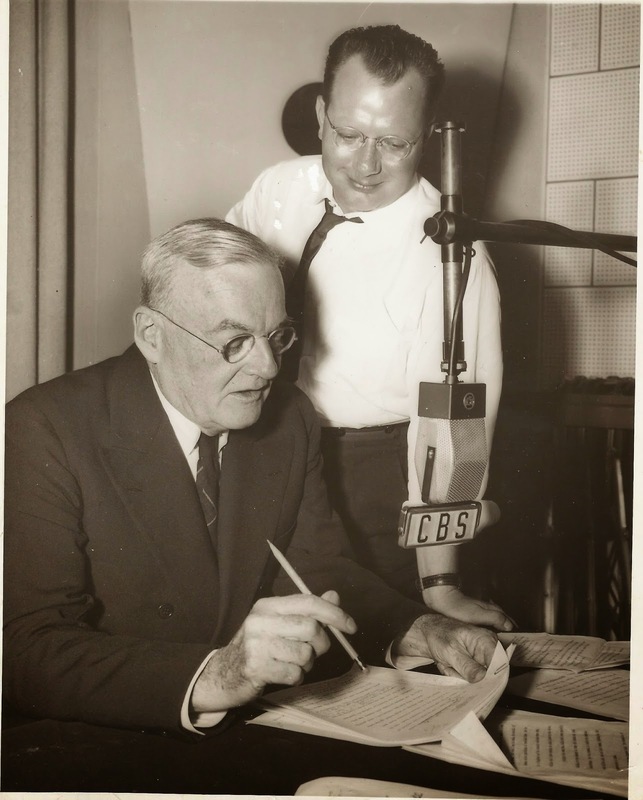 Downs was one of eight top radio and newsmen chosen to make a special plane tour leaving the United States in mid-summer of this year, making stop-overs at London, Paris, Berlin, Cairo, Baghdad, Ceylon and China. Downs reached Manchuria in time for the entry of Russia into the Japanese war. He then went on to Guam and Okinawa, and was present at the time the Japanese signed the surrender terms in Tokyo bay. Saigon, French Indochina—(UP) Two American newsmen helped fight off besieging Annamites with carbines and revolvers for two and a half hours yesterday, then walked thru the lines for help lustily singing "For He's a Jolly Good Fellow." "I don't think anybody would shoot at a man who's singing," said CBS Correspondent William Downs in suggesting the songfest. I agreed it was worth trying, and it worked. We reached a British-held airfield and sent reinforcements to the four other Americans still holding out in the besieged American headquarters. We had gone to the headquarters for lunch, only to wind up in a tighter spot than we ever had been in reporting the war in Europe. It had been eerily quiet as we drove our jeep to the headquarters, and we had to detour around several road blocks made from trees. Japanese sentries at the gate saluted as we entered. The table was laid, but we decided to wait a few minutes for Lt. Col. Peter Dewey of Washington, D.C. and Maj. Herbert Bluechel. Suddenly yelling and shooting broke out along the road 100 yards away. From a field in front of the house appeared the bedraggled figure of Bluechel. He had a .45 automatic in his hand and was pumping shots toward the road as he half staggered into the front garden. His head, neck and left side were covered with blood. "They've killed the colonel!" he shouted as tho in a daze. "They've killed the colonel." By this time a yelling crowd of perhaps 100 or more Annamites were nearing the house. "They're after us," gasped Bluechel. "They're trying to get us." He reached the house and collapsed into a chair. He said he and Dewey had run into a road barricade and had told Annamites they wished to drive thru. "Americans, Americans," they shouted, he said. But the Annamites opened up with machine guns and blew off Dewey's head. Bluechel made his way afoot to the headquarters, shooting as he came. Bluechel miraculously escaped unhurt. The blood on him was from Dewey. By this time bullets were spattering against the house. We quickly took stock. There were six of us altogether, augmented, but not much—by Japanese sentries. We ran into the garden. I flopped behind the stone wall and looked up to see Downs standing a few feet away firing with a carbine into shrubs beyond. Somebody in the garden yelled: "There goes one!" The reply came from a second floor window: "I can get him." There was a shot, then: "I got him!" "Nice shooting!" came a shout from the garden. We all took stations along the garden wall. I felt pretty helpless with my .45, but there were no more carbines left. For about a half hour we shot at Annamites on the road, in the field before headquarters, and in shrubbery along the side. Then during a break, we dashed for the house. I went to the roof with two others. We shared a carbine. Occasionally an Annamite would run across the field or a clearing in the shrubs and we'd shoot. It became pretty obvious that help would have to be summoned. We went into a huddle and Downs and I volunteered to walk to a British-held airfield a mile and a half away to get a message out. We struck out across the field giving a wonderful imitation of two scared guys trying to act nonchalant. Then Downs had his inspiration and we burst into song—not good, but apparently effective. At the airfield, we found Air Transport Command Frank Rhoads of Wilkes Barre, Pa. He telephoned British headquarters. Then Rhoads, another major, a GI and I jeeped back to American headquarters. We waved our hates and yelled "Chiw"—"Americans." It worked this time, and we passed thru eight road blocks without incident. When we reached the American house, we told them relief was on the way, then set out to find Dewey's body. We had to call off the search, however, when a force of Gurkhas advanced toward us firing automatic weapons in all directions as they advanced. We finally drove back into Saigon. Some day I hope a good historian chronicles the deep-seated disappointment of the people of Southeast Asia that followed the Allied victory over Japan. In China, Burma, Thailand, the Malay archipelago, Indo-China—and even native Hong Kong—Tokyo's surrender was supposed to produce a world that never was, nor ever could be. In the propaganda-cluttered minds of millions of Asiatics V-J Day was supposed to be followed by waves of rich and smiling Americans bringing food and medicines. More importantly, the U.S. soldiers were supposed to arrive with a form of instant democracy which would promptly bring justice to the people's oppressors and establish a functioning government of, by, and for the people. A new brotherhood of man would bring prosperity and independence and all would live happily ever after. Americans were big in those hopeful, post-victory days. Never was U.S. prestige so high among the peoples of Asia, including the citizens of what now is called Vietnam, North and South. Col. Tex McCrary's airborne correspondents corps, of which I was one, made a diversionary flight into Saigon about a month after the the Japanese surrender. The overlay of French provincial charm, seemingly the only positive heritage from French colonial rule, could not conceal the confusion and chaos seething through the city. 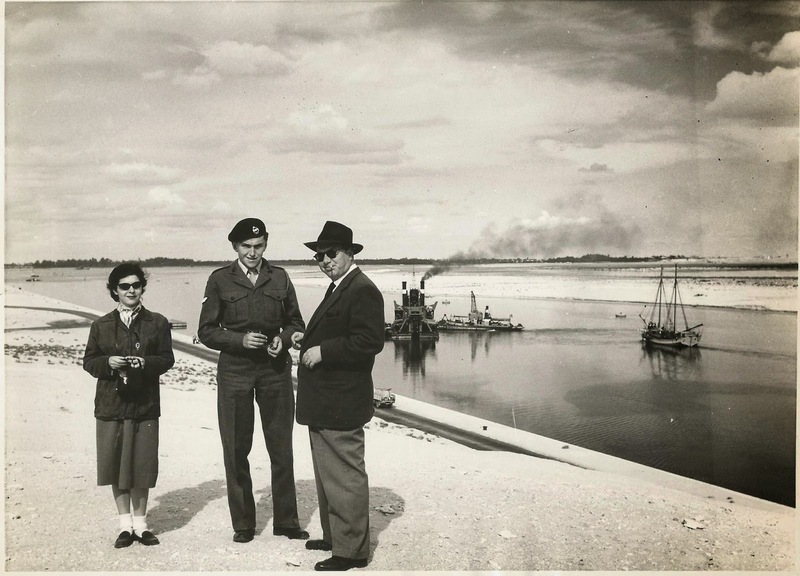 The Japanese surrender had left French Indo-China like a battered, misused orphan asylum. The orphans, both the French and the natives, were fighting for possession of the ruins. Saigon was in the death throes of outdated colonialism. The final stages had begun back in 1940 when the Japanese moved into the country. The Nipponese colonials were surprised when, instead of fighting, the resident French colons merely moved over to make room. Using the excuse of Vichy, these Frenchmen continued to exploit their rubber and rice holdings for the Axis war machine. Not even the shame of Paris nor the disaster of Pearl Harbor deterred their pursuit of the lush life as they deposited their war profits in the Banque de l'Indo-Chine. The Japanese were more cooperative, and at the same time played the other side of the coin by wooing the Indo-Chinese with their "Asia for Asiatics" program. But as Allied counter-strategy pushed the Japs back, Tokyo's proconsul in Saigon became distrustful of the resident Frenchmen. Six months before V-J Day he ordered the colons into internment camps. Meanwhile, the Japs allowed the wispy, intellectual Ho Chi Minh to marshal the nucleus of a coalition government made up of various Annamite factions from all sections of the country. And on August 17, 1945, the occupation authorities recognized Ho's new Republic of Vietnam, the first all-native government in the country's modern history. The Vietnamese fully expected that since Americans immediately occupied Tokyo after the surrender, U.S. troops would also move in to cleanse the defeated Japanese from their land. But instead of smiling GI's, there arrived a stiff, pukkasahib corps of red-tabbed British officers leading a glowering force of Gurkha troops. Gen. D.D. Gracey, Blimp-born and -educated, immediately made it clear that His Majesty's soldiers were not there to preside over the dissolution of the French colony. He summoned the closest Frenchmen at hand—the resident Vichy collaborators who now touted their brief Japanese internment as patriotic credentials—threw the new Vietnam government out of Saigon's municipal building and set up his headquarters there. The Annamite patriots—Christians, and Buddhists, democrats and Communists—took to the hills. Using liberated Japanese weapons, they formed small guerrilla bands and struck back, burning rice stores and warehouses claimed by the resurgent colons. They floated through Saigon's canals and burned huge stockpiles of rubber collected by the Japanese. So threatening and irritating were these rag-tag raids that General Gracey took political reverse action. He ordered the defeated Japanese troops to retain their rifles and guard vital Saigon buildings from the native peoples in whose name the victory had been won! The British commander refused to talk with the Sorbonne-educated Ho Chi Minh, a fellow-traveling friend of Josef Stalin (who was a U.S. ally at the time also, remember). But he got little help in his pacifying mission from the French colons. With regressive arrogance, these gentlemen appeared on the streets of Saigon to search out and beat their former Annamite employees and servants who refused to return to work. The low point of the comic tragedy was the sight of a fully armed Japanese soldier standing at solemn, bow-legged attention, carefully guiding a warehouse burning like a haystack behind him. The one calm and detached personality in Saigon's post-victory chaos was a youthful American officer, Col. Peter Dewey. 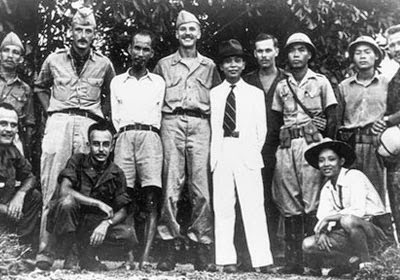 Dewey was the commander of an OSS team which had parachuted into Indo-China to aid the release of some 130 Americans interned there. 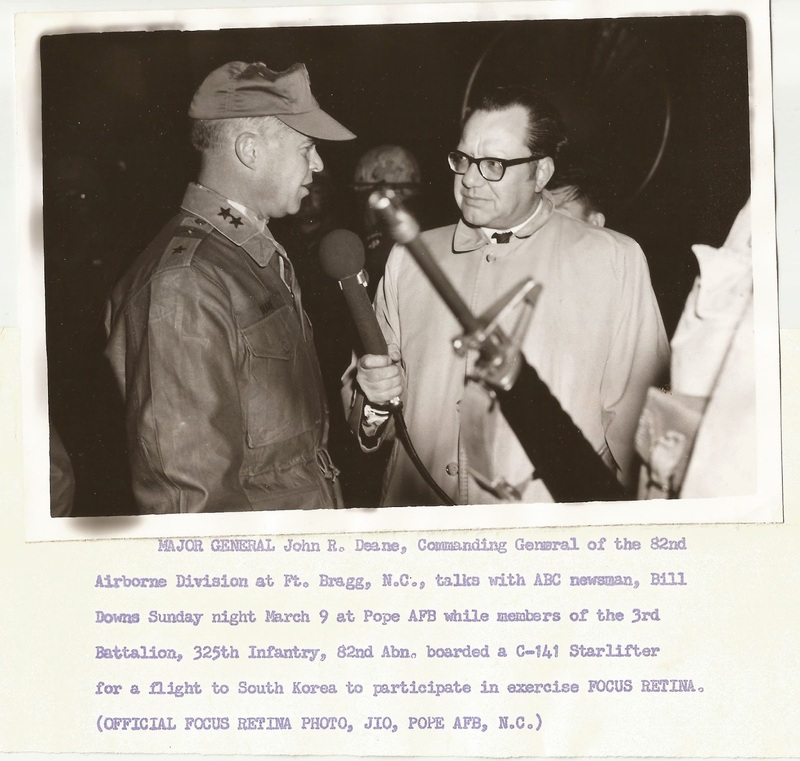 The OSS group had stayed on to be joined by a small group of U.S. Army Military Air Transport personnel who set up a headquarters at the Saigon airport. The British made no secret of their resentment of those few Americans with shortwave radio communications to Allied headquarters in Singapore. Besides, MI-5 was reporting that Colonel Dewey was making friends with the natives—even trying to contact that trouble-maker, Ho Chi Minh. The Vietnamese could not distinguish Americans from British, and this led to a tragedy that is particularly memorable in light of what is happening in Vietnam today. One afternoon UP correspondent Jim McGlincy and I were invited to lunch at the OSS headquarters in a luxurious villa on the Saigon outskirts. Colonel Dewey was to join us after checking at the airport. On the shortcut road back to the villa, a Vietnamese guerrilla force ambushed his jeep. One of their leaders later told us they thought the vehicle was British. Peter Dewey was killed. Ironically, the colonel believed in Vietnam's struggle for independence against the returning colonialism. 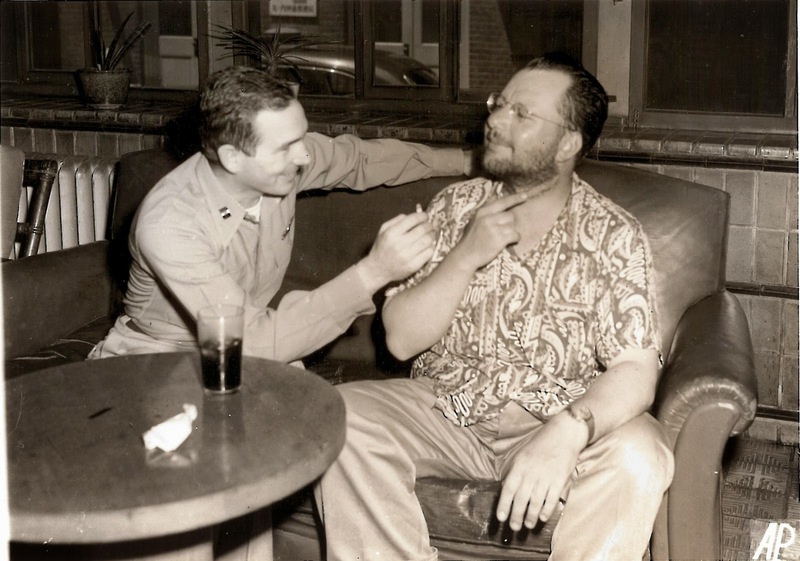 Instead of eating lunch that day, McGlincy and I, both out-of-trade correspondents from a war that supposedly was over, joined the OSS men fighting off the guerrillas. Later we failed in an attempt to recover Peter Dewey's body. So did the French colons, who quit the search long before Dien Bien Phu. "Producer Tries to Untie City's Red-Tape Tangle"
Viewers of Doug Edwards' news show Tuesday night saw CBS's answer to Pier Anderton (It couldn't have been Mr. Anderton, of course, because he is NBC's Berlin correspondent.) On closer inspection, it turned out to be CBS's veteran newshand Bill Downs. Reached yesterday in Washington where he is currently assigned, Mr. Downs explained that his full-blown beaver was the product of a fishing trip to Hatteras. "I just let it grow," he said, "and haven't decided whether I'll shave it off or not. But I am not planning to defect to hijack a plane or to invent a cough drop. Mr. Downs reported that he alerted CBS News general manager Blair Clark to his new look before doing his insert on Tuesday night's show. "If it looks too bad, you can shave it off before the 7:15 repeat," the correspondent said Mr. Clark told him. The order did not come through. Mr. Downs admitted he got a protest from San Diego saying, "for goodness sake, shave it off!" He is thinking it over, he said. 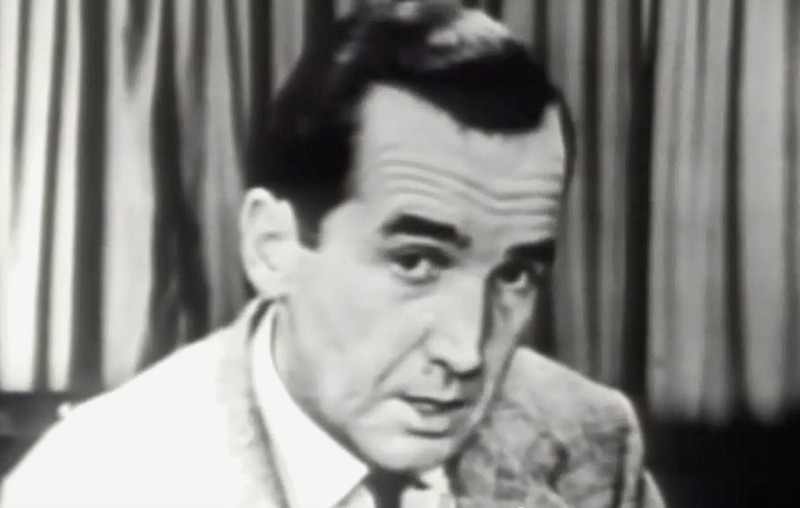 On March 9, 1954, Edward R. Murrow devoted a full episode of See It Now to criticizing Senator Joseph McCarthy. 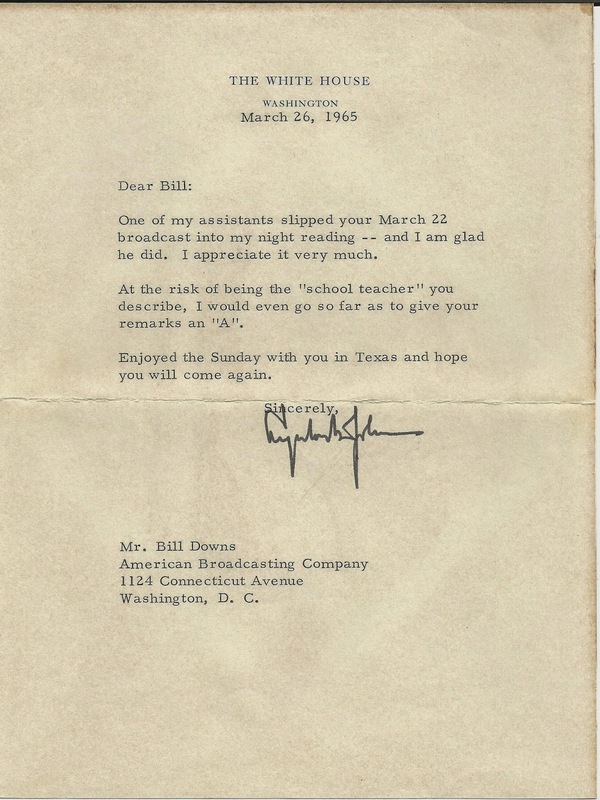 McCarthy was offered a chance to respond on air, and he did so a month later on April 6, 1954. A week before McCarthy's appearance, CBS news director Wells "Ted" Church sent out a note cautioning foreign correspondents in Europe about potential backlash. I am sending this letter to everyone in Europe except Alex, and I leave him out only because I am sure the letter wouldn't get to him in time. I had a short huddle with Ed this morning and something he said prompts me to write all of you. You all know how determined he has always been to keep each and every one of us out of trouble. Now he is very worried that McCarthy will have something to say about some of us that may hurt. I assured him vehemently that not a man on the staff would be really hurt regardless of what McCarthy said, and that, furthermore, being brought up to the firing line along side Ed would be an honor for any of us. If McCarthy shows up (and there seems to be some doubt that he will) next Tuesday night, whatever he says will undoubtedly be carried where you are as well as here. I think it would be a good idea if each of you, after hearing what is said, sent Murrow some kind of appropriate cable to disabuse his mind of any worry about any harm he may have brought down on the heads of any of us. His action stems from this very fact—he thinks maybe his action in attacking McCarthy will be responsible for what McCarthy says about someone else. I am sure you see what I mean. The news blackout still holds on this front tonight. The latest releases are that British troops have reached the Albert Canal. American troops on the right flank of the British drive are now in contact with the British east of Brussels. And over in the Channel pocket, the Canadians and the British on the left continue to close in. There can be little doubt that a decisive battle is developing—perhaps one of the final battles of the war in Western Europe. The optimism on the front is what you would expect after an advance of more than 700 miles in a week. Brussels is seething with every sort of rumor, and they pass from person to person so fast that it is difficult to convince people that they are not true. If you walked down any street in Brussels right now you can hear that Hitler has committed suicide; that Goering has flown to Sweden; that German generals are conferring about appealing for an armistice. None of these rumors can be confirmed, and no one knows where they came from. But the people repeat them with glee. We are beginning to find out now just how Belgium lived under the Nazis, for there seems to be no shortages here or anything except bread. The shop windows in downtown Brussels rival Fifth Avenue in New York for color and smartness. Their shelves, of course, are not nearly so full. But there is a good front on everything. The women dress smartly and the suits of the men seem of good quality. And people look moderately well fed, although there are some signs of malnutrition in the working districts. But it was all done through the black market, an organization which became extremely efficient during the four years of occupation. There was a black market for everything. American phonograph records could be purchased from people who had regular traffic to Spain. The film "Gone With the Wind" was shown secretly a number of times here. The price of seeing it was something like $20 a ticket. The film also was smuggled in. The finest brandies and wines were smuggled in from France despite the Nazi order that liquors were reserved for the German army. And it was possible even to buy Scotch whiskey gotten into the country some way or another. Perfumes, silk stockings, motor oil, tires, buttons, needles and thread all were and are available for those who have the money. I talked to one man who told me he paid the equivalent of $400 for a suit of clothes. This has resulted in a peculiar kind of inflation here in Belgium. But most people seem to be fairly well off, and during this liberation holiday, money is flowing in like Saturday night in a gold mining camp. However, it does shake you to walk into a restaurant and have a perfect meal. Hors d'oeuvres of sardine and tomato and ham and lettuce followed by roast chicken or steak or chops, and then finish up with ice cream or fruit and coffee and brandy. Then you find that it costs you about $70 a plate. Brussels has lived comparatively well during the occupation. But the black market has become such an institution that people are finding it hard to go into stores and ask out loud for some silk dress material—or for a bottle of brandy or for a loaf of bread. For the past four years they have been getting all this from under the counter—and from right under the noses of the Germans.